Common Mode Choke Coils support USB 3.0 SuperSpeed signals. Supplied in 1.25 x 1.0 mm 0504 chip package, DLP11TB series reduces undesirable radiation noise in electronic equipment. Film inductor forming technology is used to boost cut-off frequency to 8 GHz or more, minimizing effects of noise on signals to enable quality USB 3.0 SuperSpeed transmission. Suited to mobile devices, products have common mode impedance of 80 Ohms at 100 MHz and match characteristic impedance of 90 Ohms from USB 3.0 standard. Hoofddorp, Netherlands: Murata has released the DLP11TB series of 0504 chip common mode choke coils, which are designed to reduce undesirable radiation noise in electronic equipment. Murata's unique high-precision film inductor forming technology was mobilised to successfully attain an improved cut-off frequency in the transmission characteristics of these new choke coils compared with previous products. In the DLP11TB series, Murata has successfully boosted the cut-off frequency of the common mode choke coils to 8GHz or more, enabling USB3.0 SuperSpeed signals to be transmitted at more than satisfactory quality. The recent debut of SSDs (solid state disks) and other high-speed peripheral devices has led to the formulation of the USB 3.0 standard under which the data transmission speed is increased from the 480 Mbps provided by USB 2.0. USB 3.0 has added the SuperSpeed mode, enabling data to be transmitted at up to 5 Gbps, representing a 10-fold increase over the speed provided by the previous standard. With the increased data transmission speed provided by USB3.0, the signal frequencies have become much higher than with USB 2.0. It's therefore difficult to deal with noise issues while maintaining a satisfactory signal quality using an ordinary common mode choke coil. 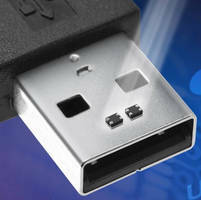 The DLP11TB series' small size, just 1.25 x 1.0mm, makes it optimally suited to mobile devices. The devices' cut off frequency has been boosted to more than 8GHz to reduce the effects of noise on signals to the absolute minimum. Features include a high common mode impedance of 80 Ohms at 100MHz and the coils match the characteristic impedance of 90 Ohms from the USB 3.0 standard. Noise outflow due to mode conversation is minimal.